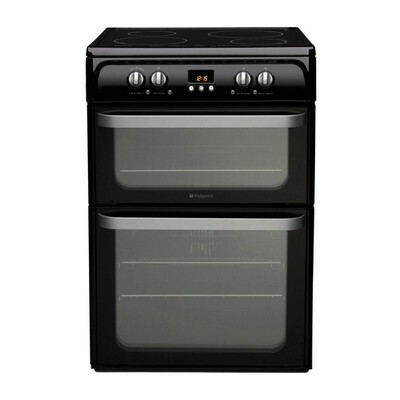 The Hotpoint HUI614K Electric Cooker comes in a sleek black finish, complete with triple glazed glass doors and a digital clock and timer for a classy, modern aesthetic. With over 100 litres of combined oven capacity, simultaneously cooking different dishes has never been easier. The main fan oven has 71 litres of capacity, while the 39 litre top oven also has a variable grill inside. Catalytic cleaning liners use the heat of the oven to break down grease and fat, so you can spend more time cooking and less time cleaning. Two different sizes of hob zones offers greater flexibility for your cooking, whilst the high-spec ceramic finish means that they look stylish and are easy to wipe down after use, saving even more time on cleaning.